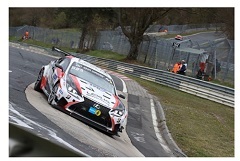 "Toyota employees take up the challenge as part of our grassroots activities aimed at developing our people and cars"
Toyota City, Japan, May 17, 2017 - (JCN Newswire) - Toyota GAZOO Racing is to compete in the Lexus RC in the 45th of The 24 Hours of Nurburgring endurance race, to be held at Germany's Nurburgring from Thursday May 25th through Sunday May 28th, 2017. The 24 Hours of Nurburgring is a grueling race that involves driving continuously for twenty-four hours on a 25 kilometer course featuring 300 meters of elevation change and about 200 corners. Toyota GAZOO Racing has been competing in this race since 2007, and it is the starting point for our activities aimed at developing our people and cars. The mechanics and engineers, who are Toyota employees, aim to test our cars to the limits and learn how to make them better than ever, by gaining experience under even harsher conditions than testing and evaluations conducted on regular test courses. This valuable experience is subsequently fed back into the development of all kinds of vehicles. In last year's race, the Lexus RC was afflicted with a powertrain issue right from the start and the team battled for 13 hours to fix it. Unfortunately, however, their efforts were not successful and the car was ultimately forced to retire. This year we have significantly accelerated the cycle of vehicle production and testing, and the RC is performing well so far. Having made substantial improvements to the car, we aim to avenge last year's disappointing defeat as we compete in The 24 Hours of Nurburgring. "The car has been steadily improving through the testing in Japan and the preliminary races (VLN, Qualifying Race) at the Nurburgring. (During the preliminary race) the car ran mostly trouble-free and the performance was almost too good in some ways, but you can never be sure what will happen in The 24 Hours of Nurburgring. I hope that the whole team will be able to maintain our focus and compete with a great sense of unity." "The incremental improvements made by both the team and the car are clearly reflected in the timing data and the driver's comments." "The whole team is working to improve their precision and resolve any remaining problems with the car, and we will continue our efforts right up to the last minute so that the drivers will have a safer and more comfortable car by the time they arrive on the starting grid at The 24 Hours of Nurburgring."